When the 2012 election finally ends, attention in Washington, D.C., will at last shift to other important subjects, including the impending “fiscal cliff” and the priorities of the “lame duck” Congress. But the refocus on policy also presents an opportunity to think seriously about how to direct government funds toward smart initiatives that deliver real-world results. In New York City, the Bloomberg administration announced a fully negotiated agreement on August 2, naming the targeted outcome, the external organization responsible for achieving that outcome, the investors, the potential rates of return for a successful outcome, and the administration’s calculations as to how much a successful outcome would save the city government. And in Massachusetts, Gov. 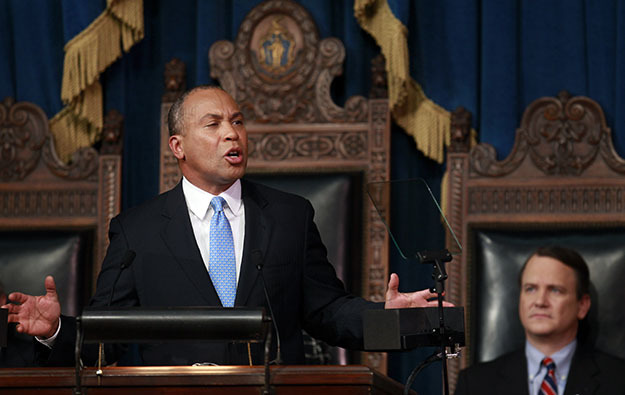 Deval Patrick (D) and his administration, after a long procurement process, announced on August 1 the names of the service providers and intermediaries they would seek to negotiate agreements with in two areas: chronic homelessness and juvenile justice. These two pioneering announcements were followed by a steady stream of media coverage and announcements of pending social impact bond deals, pilots, and proposals. New York state issued a request for information in September to identify potential opportunities. In October the Department of Justice announced two planning and implementation grants for what the Obama administration calls “pay for success” financing, one of which will go toward a proposed social impact bond in Cuyahoga County, Ohio. And just a few weeks ago, the city of Fresno, California and the California Endowment announced the first “health impact bond” pilot, which will use the same model to reduce asthma-related emergencies. 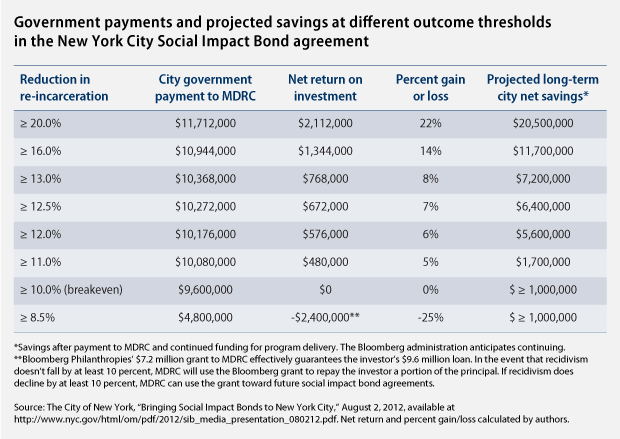 The choices made by government officials in New York City and Massachusetts in structuring their social impact bond agreements show that there is a great deal of room for local variation in using this new tool. This is a good thing, and we expect to see even more evolution in the model as various city, county, and state governments across the country explore using social impact bonds in a wider range of policy areas. But as Massachusetts officials move forward with negotiations, they need to remember that the devil is in the details. At no point is this truer then when setting the outcomes that must be achieved to trigger payment, the central point around which the rest of an agreement revolves. Massachusetts, and any future government entity entering into a social impact bond agreement, will need to ensure that outcomes are specific, measurable, and stringent enough that they cannot be accomplished merely by chance. Setting the outcomes well becomes even more important in cases where governments hope to use some portion of the anticipated savings from a successful outcome to fund the eventual payment. The outcome must be clearly defined and measurable while remaining ambitious but achievable within the time frame specified. Government funds should not be released until and unless the outcome is achieved. External organizations should have considerable freedom to define the strategy that seeks to achieve outcomes. So long as these principles are retained, the structure of the deal and the players at the table can potentially take many different forms. Social impact bonds have great potential in a range of preventive social programs, including those aimed at tackling recidivism, chronic homelessness, workforce development, health care, energy efficiency, and early childhood education, among others. These complex deals have the potential to not only save governments money in the long term, but more importantly to improve outcomes in a real, measurable way for citizens. To understand more about how a social impact bond agreement may be set up in the real world, let’s consider the New York City and Massachusetts announcements in turn. In New York City, juvenile offenders between the ages of 16 and 18 serve their sentences in the adult corrections system. Recidivism is very high among these youth—nearly 50 percent of young offenders return to Rikers Island within a year of their release. Currently, adolescents incarcerated on Rikers do not receive consistent services to prevent re-offending. Mayor Michael Bloomberg’s August 2 announcement of the first social impact bond agreement in the United States was detailed and precise. 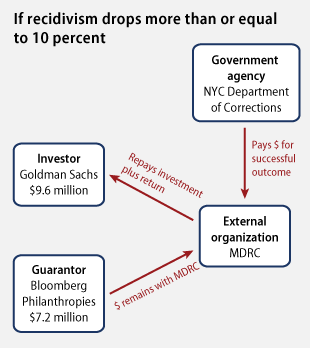 The city of New York contracted with MDRC, a nonprofit, nonpartisan social research organization, to reduce the rate of recidivism by at least 10 percent over four years among annual cohorts of about 3,000 young men exiting Rikers Island. To achieve the results, MDRC will manage two nonprofit service providers, the Osborne Association and Friends of Island Academy. The working capital for the intervention—$9.6 million over four years—is being provided by Goldman Sachs, structured as a loan to MDRC. In a feature unique to the New York City agreement, Bloomberg Philanthropies will be guaranteeing the loan by making a grant of $7.2 million to MDRC over the same four-year period. MDRC will hold the grant in a guarantee fund to back the loan from Goldman Sachs. 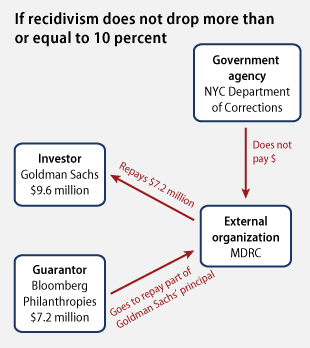 If recidivism does not fall by at least 10 percent, MDRC can use the grant to repay Goldman Sachs a portion of their principal. So instead of standing to lose all $9.6 million of their investment if the deal fails, as investors in the Peterborough Prison social impact bond do, Goldman’s maximum loss is only $2.4 million. 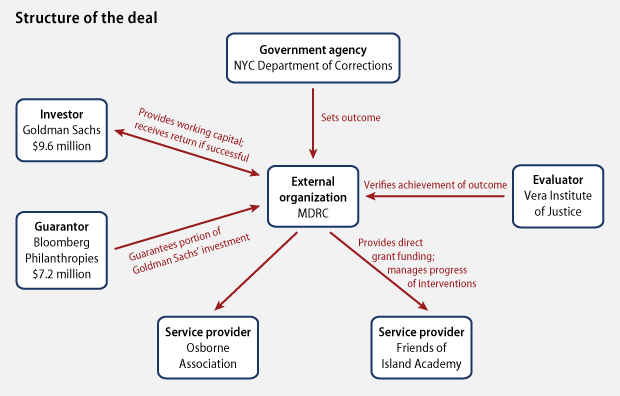 The results will be evaluated by the Vera Institute of Justice using a quasi-experimental evaluation model to determine whether MDRC has achieved the targeted reductions in recidivism at the end of the agreement. The evidence-based intervention being used is called the Adolescent Behavioral Learning Experience, and it focuses on personal responsibility education, training, and counseling, according to the city’s press release announcing the agreement. Negotiations and calculations for New York City’s social impact bond were largely conducted behind closed doors. So when it came time to announce the deal, most of the details were finalized. Much of the press coverage of the agreement has focused on the players at the table, and particularly on the involvement of Goldman Sachs. But much more important than knowing who is going to be involved is knowing what is meant to be accomplished by the deal, which the city has laid out very clearly. The Bloomberg administration should be praised for the clarity with which they’ve expressed the outcomes set in the deal, the varying levels of potential repayment, and the expected long-term savings to the city. The Bay State first announced its interest in pursuing social impact bonds in May 2011, issuing a request for information and seeking proposals for areas where this approach may be useful and appropriate in Massachusetts. The state then solicited proposals in January 2012 from potential intermediaries and service providers in two areas: chronic homelessness and juvenile justice. Massachusetts announced the selection of “initial successful bidders” for these contracts during the same week in August that New York City revealed its social impact bond agreement. The state intends to negotiate final contracts with the selected intermediaries and service providers. The state has already been a leader in addressing some of the challenges inherent in the social impact bond model. In January 2012, for instance, Gov. Patrick signed legislation backing “pay for success” contracts with the full faith and credit of the government of Massachusetts and establishing a “Social Innovation Financing Trust” to hold outcome payments for the duration of a social impact bond deal. Because these agreements by their very nature stretch over several years, some have expressed concern about whether governments will honor the contracts if the governorship changes hands or parties. The Massachusetts legislation offers a joint mechanism for addressing that concern. First, the trust will be funded through annual appropriations, the level of which will be determined based on the eventual payout for a successful outcome. Second, as added insurance for the external organizations, the “full faith and credit” provision means failure by the government to meet its payments at the end of a successful arrangement could mean a hit to Massachusetts’s credit rating. The juvenile justice contracts will be designed with the specific goal of reducing recidivism and improving education and employment outcomes over a 6 year period for a significant segment of the 750 to 800 youth discharged from the juvenile corrections system at age 18 or 21 and the roughly 3,000 youth who complete their term of probation annually. The solicitation also asked respondents to sketch a budget for their plan, assuming that the respondents would work with about 300 youth and that avoiding re-incarceration for two years following release from the juvenile system would save the state $30,000 per person. As Massachusetts moves forward, it will need to define outcomes precisely and ensure that payment levels are commensurate with the value that the state places on those outcomes. In the original social impact bond model, choice and oversight of service providers is primarily the responsibility of the external organization. Massachusetts decided to conduct a separate procurement to select the service providers. An open question in the state is how, exactly, this tripartite relationship—between the government, the intermediaries, and the service providers—will work, and what responsibilities each party will have to the others. The state should consider whether the intermediaries in these deals will retain the power to oversee the mix of interventions being used to achieve the outcome and to make adjustments as necessary. If the intermediaries will not be able to modify or replace the interventions being used, the state may risk being blamed should the deal ultimately fail, as they were responsible for procuring the service providers. The Patrick administration in Massachusetts should be praised for its work in advancing “full faith and credit” legislation and for its decision to hold an open, public procurement. It’s worth remembering that Massachusetts is the first state in the country pursuing this innovative, outcomes-based financing mechanism. Being a pioneer isn’t easy, and the choice to hold an open procurement in the public eye can make the task even more challenging, because most decisions will find at least some detractors in the media or in other parts of government. But the state will need to exercise care as it sets outcome and payment levels in its two proposed social impact bond deals. And because of the choice to directly and separately procure service providers, it will be particularly important for the state to ensure that the relationships between the government, the intermediaries, and the service providers are clearly defined. Otherwise, the state may find that government retains more financial and execution risk than should occur under a social impact bond. Launching any new initiative is always challenging—and social impact bonds are no exception. Social impact bonds ask governments to almost completely rethink the way they do business—to start from the outcomes they are trying to achieve rather than from the activities they are willing to fund. These unusual financial arrangements will often also require workarounds for annual appropriations processes—Massachusetts’ Social Innovation Financing Trust is a successful example of one such effort—and require a good deal of precision and thought in contracting and procurement. For social impact bonds to be as successful as they might be, government agencies also will need to learn a difficult skill: ceding some control to the external organization they partner with and, with appropriate but limited oversight, trusting that organization will act to best achieve the desired outcome. Both New York City and Massachusetts should be lauded for their truly impressive and innovative efforts to implement this new method to finance social programs. These experiences will inform the other states and municipalities currently in the earlier stages of the social impact bond process. While there are still a great many questions—including whether these deals will be successful and what, exactly, will be targeted in the Bay State’s two pending agreements—2012 has certainly seen significant steps toward improving social outcomes in a concrete way. Kristina Costa is a Research Assistant and Speechwriter at the Center for American Progress. Jitinder Kohli is a Senior Fellow at the Center.